Subject to the availability of spares. 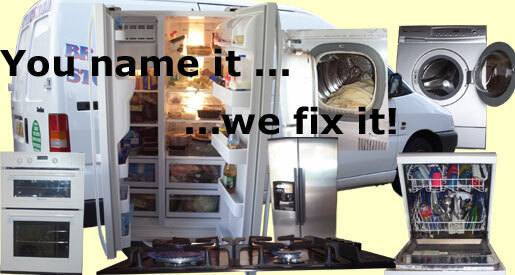 We also fix dishwashers, cookers, tumble dryers and refrigerators. ...to ABS. We are currently two service engineers providing same and next day repairs throughout Bristol and surrounding areas. Yes, you name it - we fix it! This is a washing machine repair service as well as repairs to your dishwasher, cooker, fridgefreezer and tumble dryer. All is subject to the availability of spares. Incidentally, spares are easily available for well known names such as: Ariston, AEG, Bosch, Creda, Candy, Electrolux, Hoover, Hotpoint, Indesit, LG, Miele, Neff, Servis, Smeg, Siemens, Samsung, Tricity Bendix, Whirlpool and Zanussi. If you are fortunate enough to be living within the serviceable postal areas of Bristol, as listed, you can rest assured that you have just discovered the finest, across the board, Washing Machine, Dishwasher, Cooker, Fridgefreezer and Tumble Dryer service engineers Bristol has ever known. Note, we are not just service engineers for Hotpoint, we are also service engineers for Hoover, Creda, Ariston, Whirlpool, Service, Electrolux, Bosch, AEG, Zanussi, Tricity Bendix, Miele, Siemens, Smeg, Samsung, Candy, LG, Neff, Ocean, Dyson, Diplomat, Brandt, Beko, Dedietrich, Rangemaster, Leisure Range, Indesit and many more. We repair every available brand of UK white goods, subject to the availability of spares. You name it - We fix it! As well as offering a local repair service, this site deals with safety issues surrounding domestic appliances, recommends washing machines that are best suited to your family's needs, gives technical advice, and lots more. If you are interested in buying good washing machines, dishwashers, cookers, fridges/freezers and tumble dryers, you may wish to consider the openion of a service engineer and read what he has to say in the recommend a washing machine section. This section recommends several washing machines including the very best. You can compare online prices in the recommend a washer section on cheap washing machines, quality washing machines and reliable washing machines. Before you shop online, find out if it is the Whirlpool washing machines, Bosch washing machines or Miele washing machines that are best for you. First you must choose how many wash loads you do each week and the washing machine that is best suited to your family's needs will be revealed. One of the most frequently asked question is: "can you recommend a good quality, cheap washing machine?" The answer is yes and it is here You can find all these qualities in Whirlpool washing machines, Bosch washing machines and Miele washing machines. You may not realise it but some washing machine spares come as patterned, which is a copy of the genuine part. The same can be said for dishwasher spares, cooker spares, tumble dryer spares, fridge and freezer spares. While we are on the subject of spare parts, it should be noted that buying domestic appliance spares in order to carry out your own repairs has serious safety issues you should be aware of. As always, we are happy to give advice when asked for. However, this is becoming very time consuming and as such I have had to revise how I continue to provide this service. If you prefer to fix the fault yourself, follow this link for help and advice. It is very likely that we have dealt with customers that had similar appliance faults to yours before. This experience has enabled us to quote exact repair costs or at worst,to within a few pounds over the telephone! Bob at ABS Bradley Stoke and Derrick at ABS Yate have been endorsed as Which Trusted Traders.